November 6, 2017 2B Omar Infante elected free agency. December 20, 2016 2B Omar Infante assigned to Toledo Mud Hens. December 9, 2016 Detroit Tigers signed free agent 2B Omar Infante to a minor league contract and invited him to spring training. August 16, 2016 Gwinnett Braves released 2B Omar Infante. July 6, 2016 Atlanta Braves signed free agent 2B Omar Infante to a minor league contract. July 6, 2016 2B Omar Infante assigned to Gwinnett Braves. June 21, 2016 Kansas City Royals released 2B Omar Infante. June 15, 2016 Kansas City Royals designated 2B Omar Infante for assignment. November 2, 2015 Kansas City Royals activated 2B Omar Infante. October 8, 2015 Kansas City Royals reassigned 2B Omar Infante to the minor leagues. May 26, 2014 Kansas City Royals activated 2B Omar Infante from the 15-day disabled list. May 23, 2014 Kansas City Royals sent 2B Omar Infante on a rehab assignment to Omaha Storm Chasers. December 16, 2013 Kansas City Royals signed free agent 2B Omar Infante. 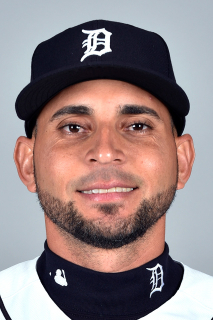 August 12, 2013 Detroit Tigers activated 2B Omar Infante from the 15-day disabled list. August 6, 2013 Detroit Tigers sent 2B Omar Infante on a rehab assignment to Toledo Mud Hens. July 24, 2013 Detroit Tigers sent 2B Omar Infante on a rehab assignment to West Michigan Whitecaps. July 9, 2013 Detroit Tigers placed 2B Omar Infante on the 15-day disabled list retroactive to July 4, 2013. Left ankle sprain. December 26, 2012 2B Omar Infante assigned to Caribes de Anzoategui. July 24, 2012 Detroit Tigers activated 2B Omar Infante. October 12, 2011 2B Omar Infante assigned to Caribes de Anzoategui. August 20, 2011 Omar Infante roster status changed by Florida Marlins. August 17, 2011 sent 2B Omar Infante on a rehab assignment to Jupiter Hammerheads. August 5, 2011 Florida Marlins placed 2B Omar Infante on the 15-day disabled list. Fractured right middle finger. November 16, 2010 Atlanta Braves traded LHP Mike Dunn and 2B Omar Infante to Florida Marlins for 2B Dan Uggla. October 9, 2009 2B Omar Infante assigned to Caribes de Anzoategui. August 11, 2009 Omar Infante roster status changed by Atlanta Braves. August 10, 2009 Rome Braves sent 3B Omar Infante on a rehab assignment to Gwinnett Braves. August 4, 2009 Omar Infante assigned to Rome Braves.